As far as science experiments go, I prefer the ones that are easy and use items we already have in the kitchen. Sorry world. I am not ambitious when it comes to science. 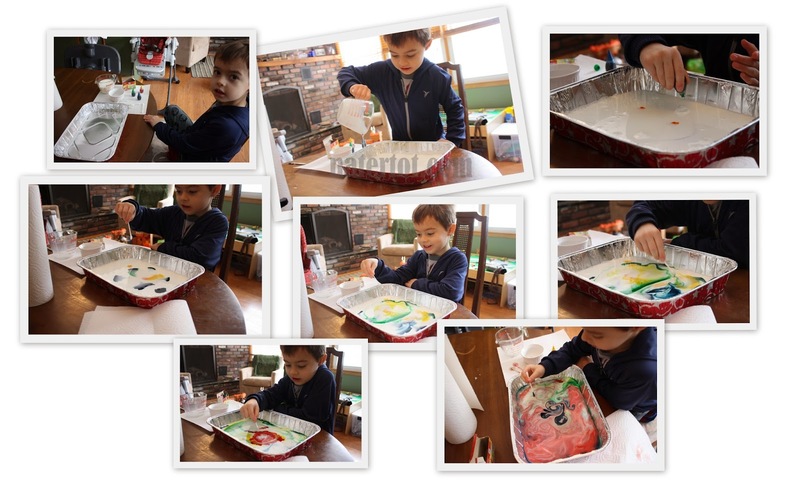 So when I saw this experiment somewhere online that required only milk, hand soap, q-tips and food coloring, I was all about forcing Nate to do it with me during his February break. After 3 days of bugging him, he finally agreed to do it (in between episodes of Ninjago). To start, you just pour some milk in a container and squeeze out some dots of food coloring. Then you dunk your q-tips (I prefer unused, but I encourage others to follow their hearts here) into the soap and dip them into the dots of color. And then BOOM!! Massive explosion! Just kidding. No loud explosions, but the colors do softly expand and swirl into really cool patterns. We thought ours looked like dragon milk. I should note that although we did not discuss chemicals reacting or anything, but I'm still totally counting it as a science experiment anyway.